In our previous article, we show you how to record MAC screen with Quickcast application. Today, we are back again with a small utility for Windows ScreenToGif. A free to use application for Windows Machine users, which gives you the ability to record your desktop screen and save it as Animated Gif. One of the best and easy to use tool to create animate gif on your desktop. With this tool you can record anything on your screen like some application demo or any other kind of tutorial for the presentation. Currently the application is only available for the windows user and works on all windows platform. Screen to Gif is a portable software, no need to install the application on your windows, Just run the .exe file of the application and start recording your screen. The application also allows you to change the screen size of the recorder, so you can adjust the size of the recorder screen as per your choice. 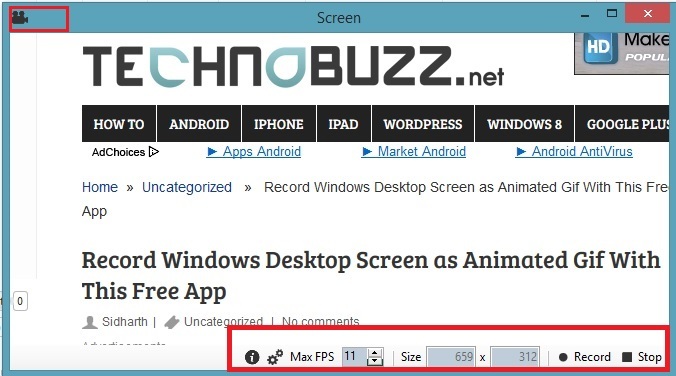 You can also change frame height & width and Max FPS. Download the application from the end of this post and save the folder on your desktop. Once the file is downloaded, extract the folder on your desktop, in the folder you will see the GifRecorder.exe file. 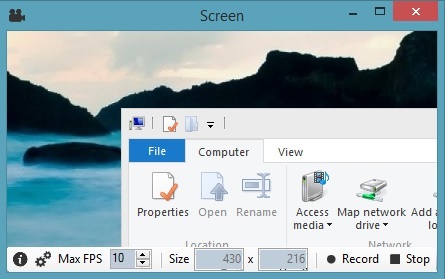 Run the .Exe file on your desktop and screen recorder window will open on your windows desktop. The best thing we like about the application is that, you can record anything on your windows and save them on your desktop. We tested this application on our Windows 8.1 64edition Pc and application works without any problem.